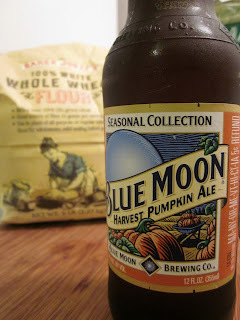 I thought I'd use some leftover pumpkin beer - from our Halloween camping trip - for a Blue Moon Pumpkin Ale Whole Wheat Bread. It was deliciously simple. In a large bowl mix the dry ingredients. Slowly pour in the beer. Stir to mix. Batter will be very sticky. Pour batter into a buttered loaf pan. Bake in a preheated 350 degree oven for one hour. Dylan looked through the same Halloween pamphlet and picked our main dish: mummified hot dogs; he called them "HalloWeiners." Cute. We started with nitrite-free, uncured all-beef dogs from Trader Joes's. 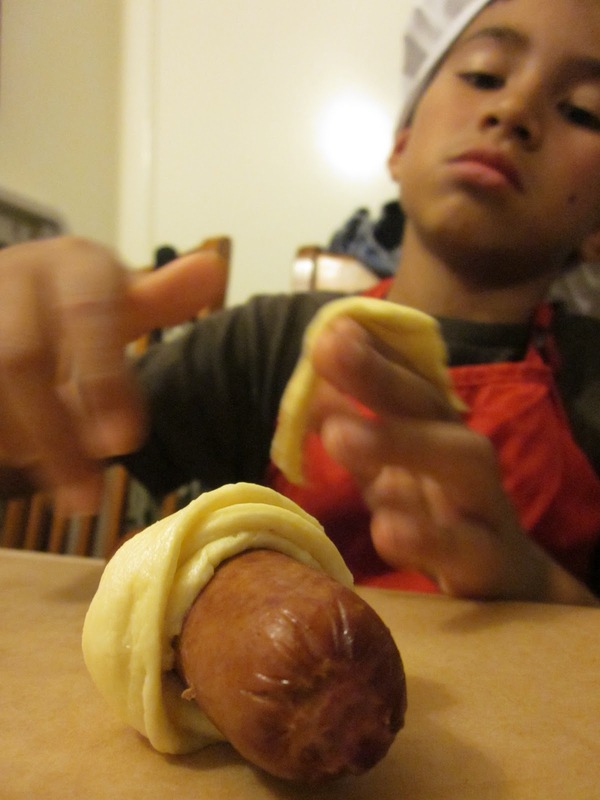 Then Dylan wrapped strips of biscuit dough, somewhat haphazardly, around them. Combine and mix ingredients together. Pour out on floured waxed paper. Pat the dough out with your hands until dough is not sticky. Add flour as needed. Cut biscuits into strips. Bake on parchment-lined cookie sheet at 425 degrees F for 20-25 minutes, or until golden brown. Create eyes with dots of mustard and serve them with a pool of "blood" (organic ketchup). Since the boys were homework-free tonight, assuming that kids would be out late trick-or-treating, I let them plan and cook dinner. 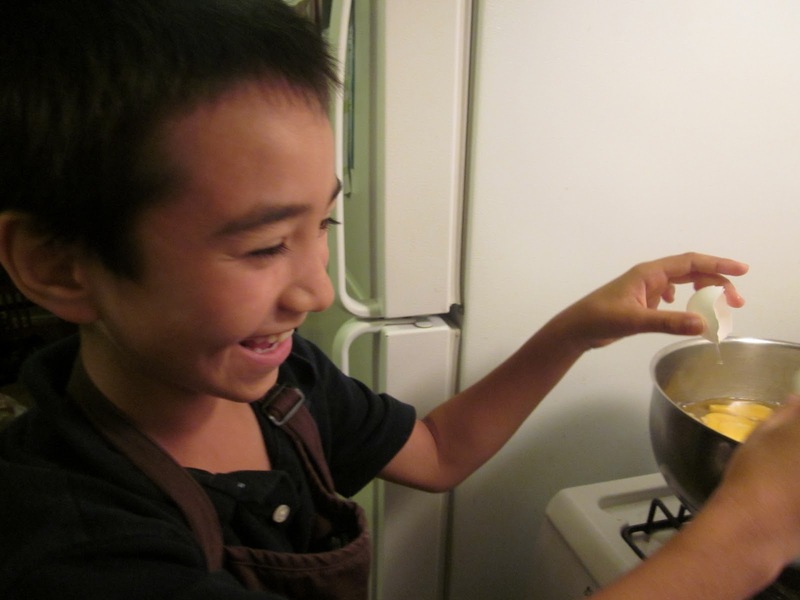 Riley found a recipe for witches' brew in a Halloween recipe pamphlet. 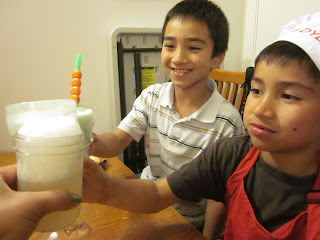 We didn't have all of the ingredients, but we made due and I let him put a drop of food coloring in to make it green. Every once in a while is okay, right? 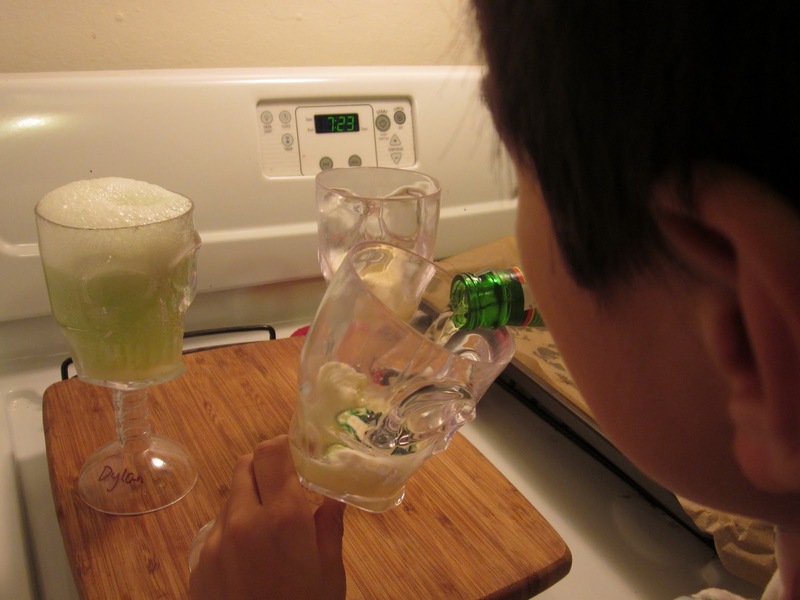 Place the ice cream and lemonade in a festive glass. 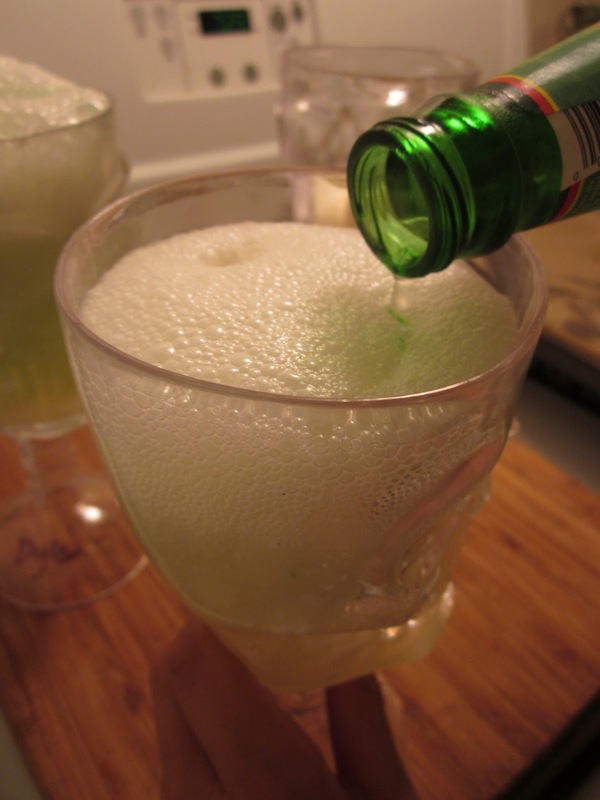 Pour the ginger beer slowly over the top. Stir gently to dissolve the ice cream. Make the soup: Saute leeks, onions, and fennel slices in a splash of olive oil until softened and beginning to caramelize in a heavy stockpot. Add coconut milk and chicken broth and bring to a boil. Reduce heat, stir in curry mixture, simmer for 5 minutes. Add squashes, peppers, and cauliflower and cook until slightly tender. 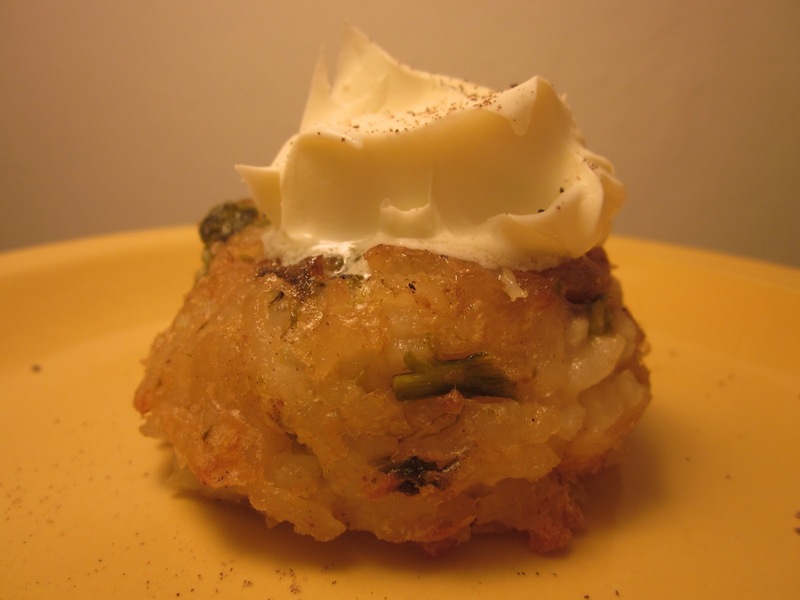 Serve with pumpkin rice, lime wedges, and fresh scallions. 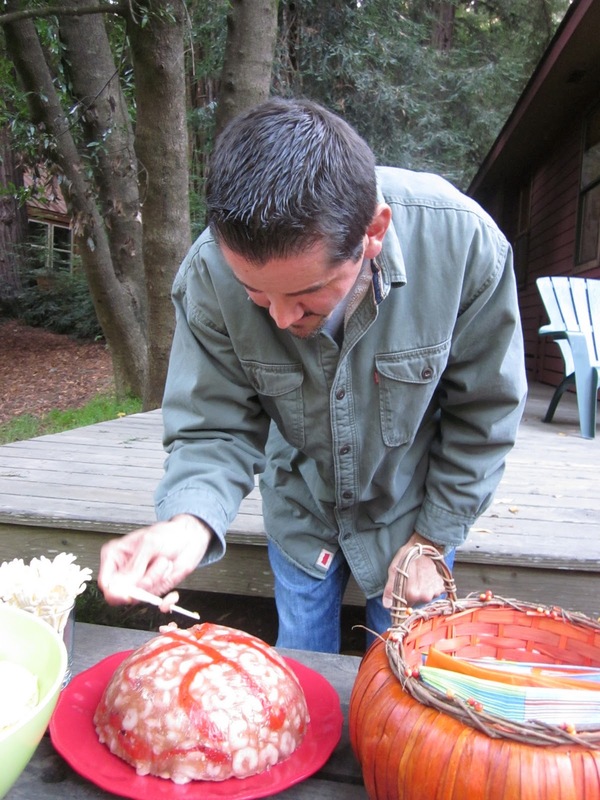 For our annual Halloween camping trip, we all bring appetizers to share during the pumpkin carving. 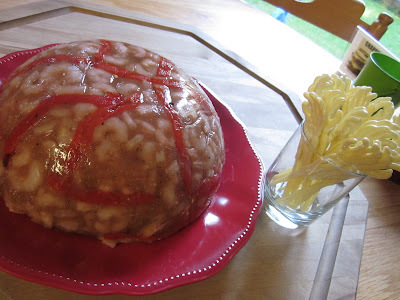 I wanted to bring something not only tasty, but festive; I found a recipe for a freaky shrimp cocktail brain. Perfect! In a glass bowl, arrange shrimp, tails toward the center, in a circle to make a flat layer in the bottom of the bowl. Repeat layers until bowl is full, pressing down every couple layers. As the bowl fills up, tuck strips of the roasted red pepper in and around shrimp forming "blood vessels". When bowl is full, press down firmly with a plate that fits inside the bowl. Set aside. 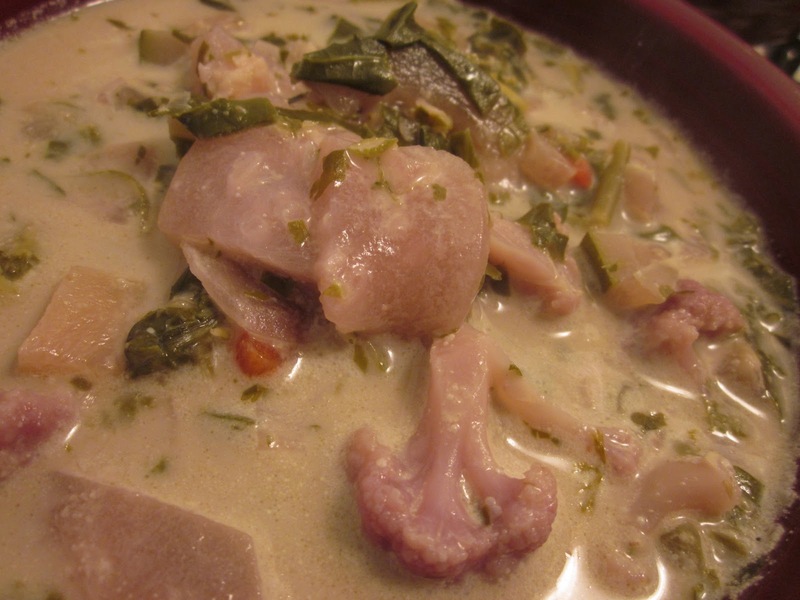 In a small saucepan combine chicken broth and unflavored gelatin; let stand 5 minutes. Cook and stir over medium heat until gelatin has dissolved. 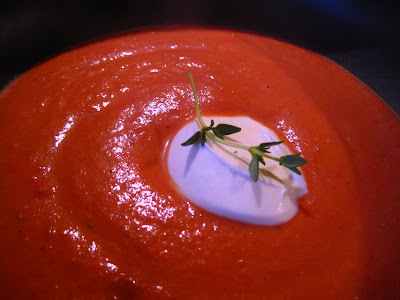 Whisk in lemon peel, lemon juice, tomato paste, honey, garlic, salt, ginger, and cayenne pepper until combined. Pour mixture over shrimp in bowl. Cover and chill overnight. To unmold, set bowl in a sink filled with warm water for several seconds. Invert a large plate with sides over bowl. Invert plate and bowl together and remove bowl to unmold. Cover and chill until needed (up to 24 hours). Breast cancer research is an issue that I hold dear to my heart as breast cancer has touched our family on both sides – my Ninang Bella, my aunt Aileen, Jake’s Aunt Sally, and Jake’s Aunt Darla. I have participated in the Race for the Cure for many years, including the inaugural race through Golden Gate Park with my mom when I was in college and even while I was 7 months pregnant with Dylan in Oklahoma City. A few years ago, Jake, Riley, Dylan, and I all did the Race for the Cure 5K in San Francisco, wearing those ladies’ names on our shirts. So when Marilyn of the Artsy Girl Connection invited me to be part of a blog hop for breast cancer awareness, I didn't hesitate to participate. 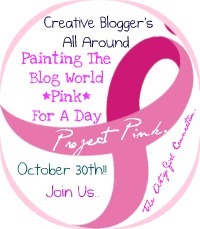 See the other bloggers, below, who are also painting the blogosphere pink for a day, today. Here are a few PINK treats that I've made over the years. Enjoy! Cin cin! Make a pink syrup out of beets for a pretty cocktail. 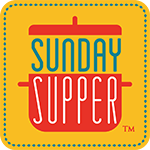 Soup's on! Start dinner with a fuschia-hued beet soup. Color your homemade gnocchi rosy! 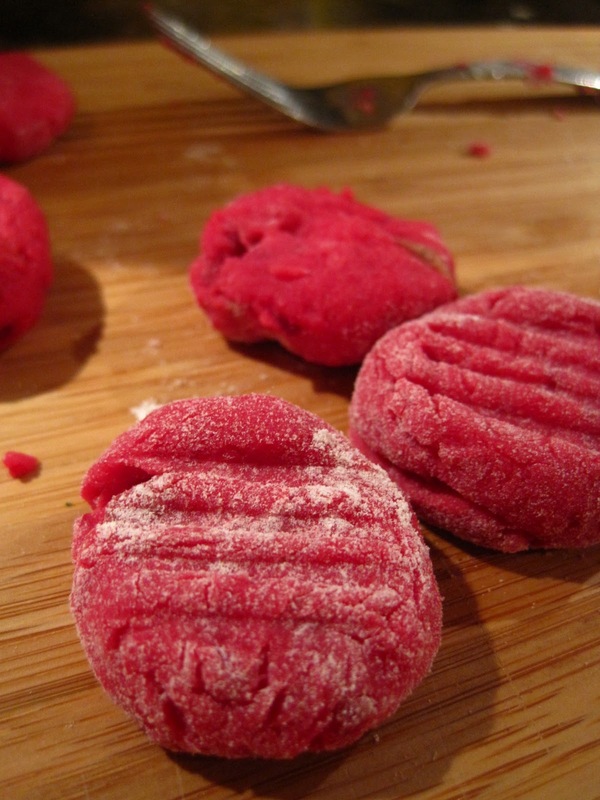 Try my beet-asiago gnocchi. 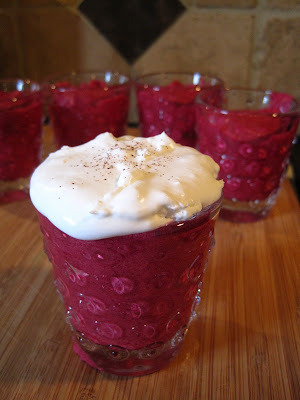 How about a uniquely hued mousse: spiced beet mousse?!? ...or cardamom-beet marshmallows for a pale pink treat. 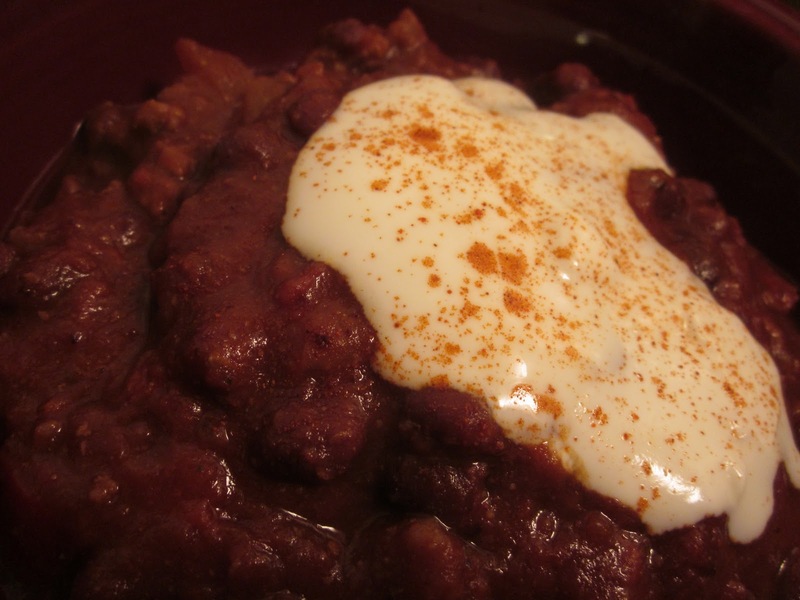 I was going to make the chili that won me the title of 'Grand Champion' at the Erickson's 4th of July party a couple of years ago: my Chili al Diavolo, but I didn't have three hours to braise the meat or overnight to let the flavors develop. So, I adjusted the recipe to have more flavor upfront versus needing to steep...plus I added some pumpkin puree. 'Tis the season, after all. Dice the onions and red bell peppers. Sauté in olive oil till they start to soften. Brown the beef with the onion-pepper mixture. Season with cumin, sea salt, paprika, and ancho chili powder. Add the pumpkin, crushed tomatoes, pumpkin puree, and beans. Bring to a boil, then simmer for one hour. 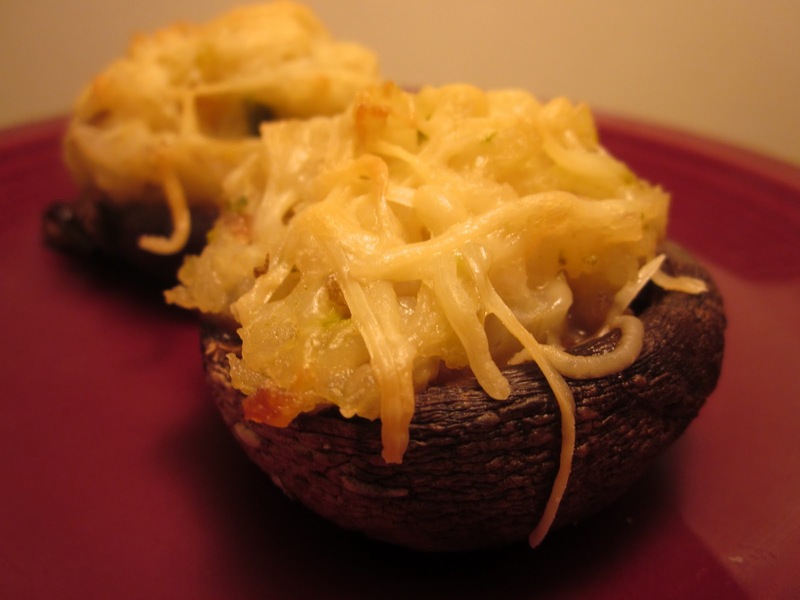 Serve hot, topped with plain greek yogurt, shredded cheese, and a dash of paprika. 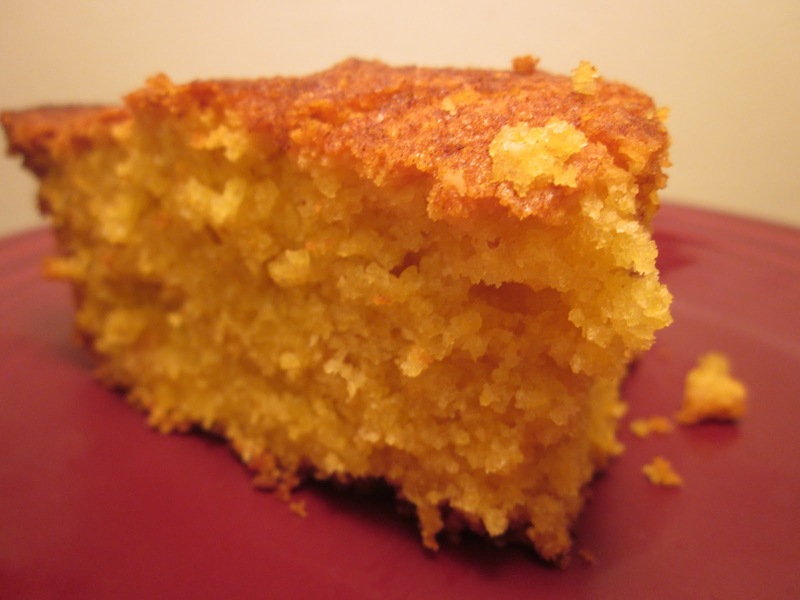 Serve with pumpkin cornbread. Given that Halloween is right around the corner, I added some pumpkin to both our chili and our cornbread for dinner tonight. The pumpkin imparts not just an orange hue but a subtle flavor. Perfect! Preheat oven to 350. Butter your baking dish. 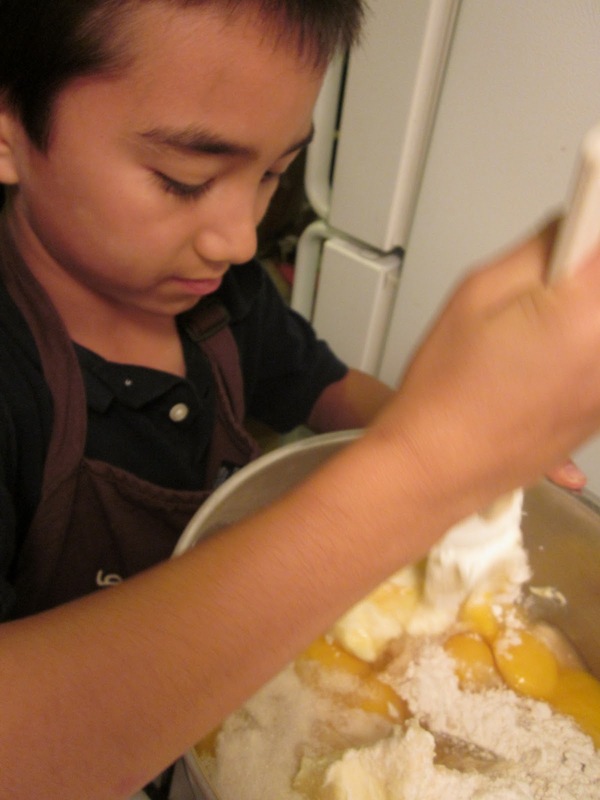 Combine all ingredients in a mixing bowl and stir till everything is moistened. Pour into prepared pan and top with a sprinkling of more corn meal and paprika. Bake for 40-45 minutes or until a wooden pick inserted in the center comes out clean. Serve warm. Every year, for the past five years, we've headed to the not-too-distant wilderness for an annual Halloween camping trip. 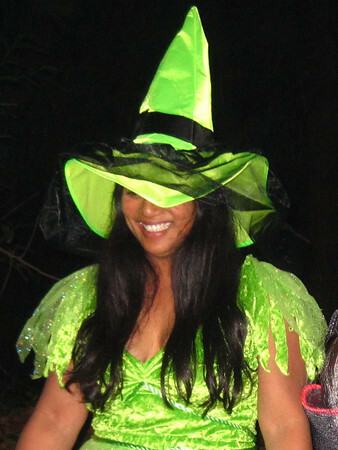 Sugar-Nazi that I am - notice the witch costume which isn't too far from the truth most days of the year! - this camping trip is a way to ensure that my kids get to enjoy Halloween festivities such as trick-or-treating (just the sites for the families who have joined us) but we aren't bombarded with a bunch of stuff we aren't going to eat. 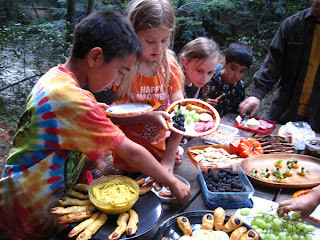 We have a pumpkin carving contest, we potluck, we trick-or-treat, we camp, and we have a blast. We all bring appetizers, whatever we want to toss on the grill, and shared potluck dishes for an evening feast. I won't tip my witch's hat before the trip, but I'm excited about the dishes I've picked as my contributions this year. Last year I brought a pumpkin soup, some pumpkin-shaped cheese balls, and pumpkin-ginger truffles. 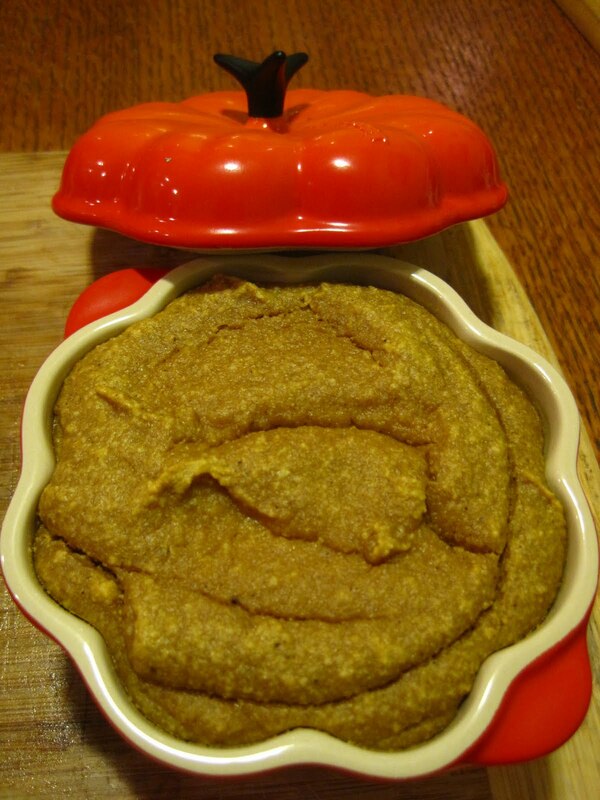 But my favorite dish was a Pumpkin Pâté. 1. Soak the raw cashews for 30 minutes in salted water. Drain, but reserve the water for use in the dip. 3. Add the drained cashews, pumpkin, maple-agave syrup, tangerine juice, oil, salt and spices to a food processor or high speed blender. 4. 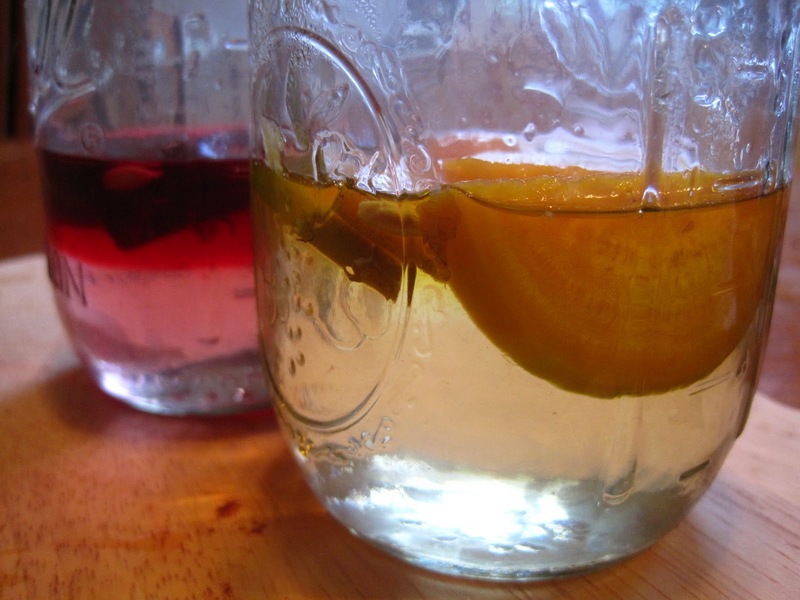 Add the water in a few splashes at a time. Process until the desired texture is reached. 5. Season to taste. Add in more spices/salt/sweetener/tangerine juice as you wish. You can also add in additional flavor changers like harissa for a smoky, spicy taste; or crushed sage for a warm herb flavor; or extra black pepper for a little kick. 6. Pour your pâté into your baking serving dish. 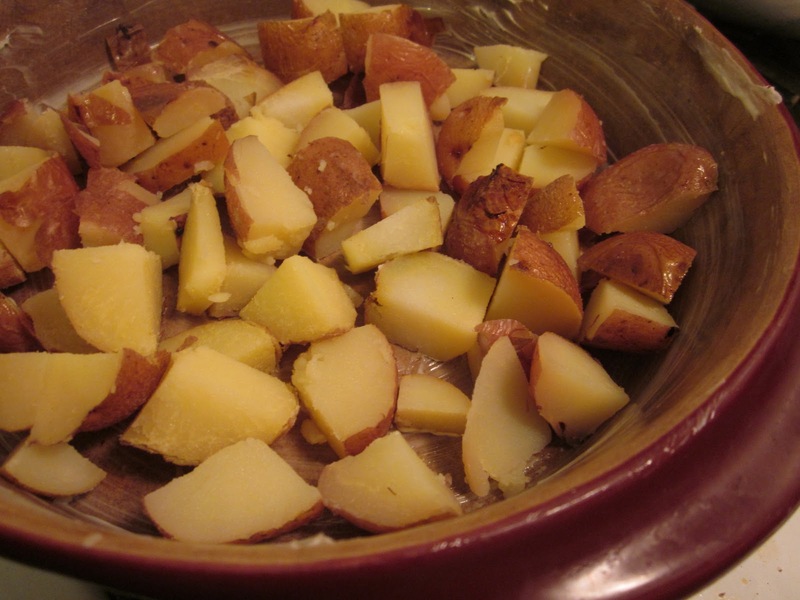 Shallow dishes will result in a firmer/drier end product. Deep dishes will keep your smooth creamy texture. 7. For a shallow dish, bake at 250 for 50+ minutes. For the deep dish where you only want to warm the center and crisp the top you only need to bake at 250 for 20-30 minutes. The pâté will dry out the longer you bake it. 8. Plating. Serve warm or chilled. 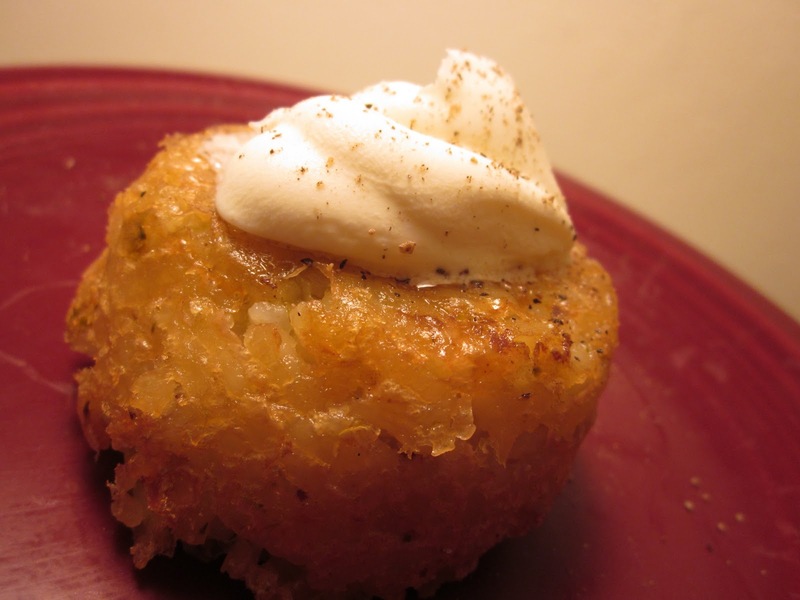 You can also add a drizzle of pumpkin seed oil and/or maple-agave syrup over top. 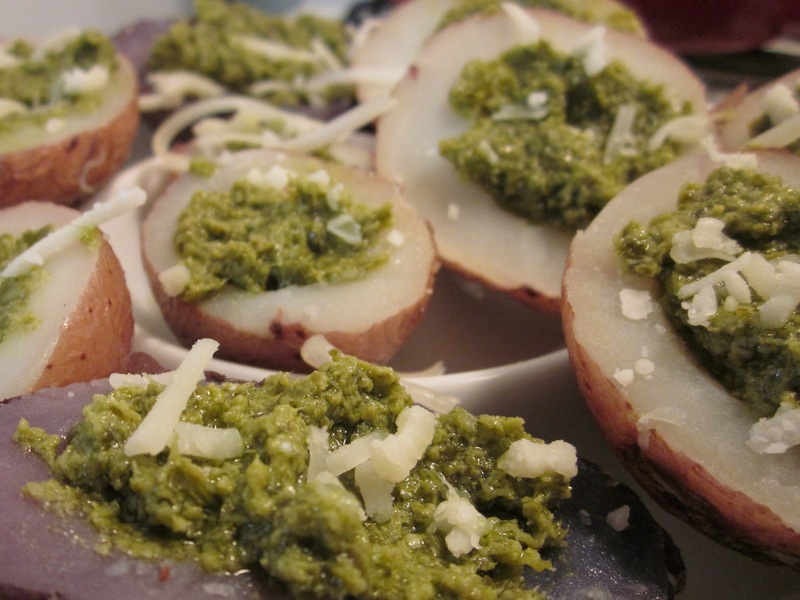 I had a few roasted potatoes leftover from when I made pesto-filled potatoes for a picnic. I decided to revamp them into a frittata with some wild mushrooms. Preheat your oven to 350 degrees. 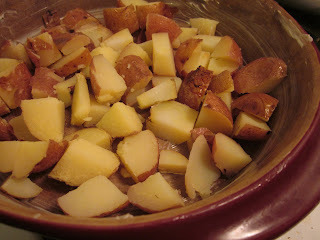 Butter a baking dish and place potatoes in it. Top them with the mushrooms, fresh herbs, and eggs beaten with heavy cream. Season with herbs, salt, pepper, and top with shredded cheese. Cover the pan with aluminum foil and bake for about 30 minutes. Remove the foil and bake an additional 10 minutes. Slice into wedges and serve. Preheat your oven to 350 degrees and clean the mushrooms. 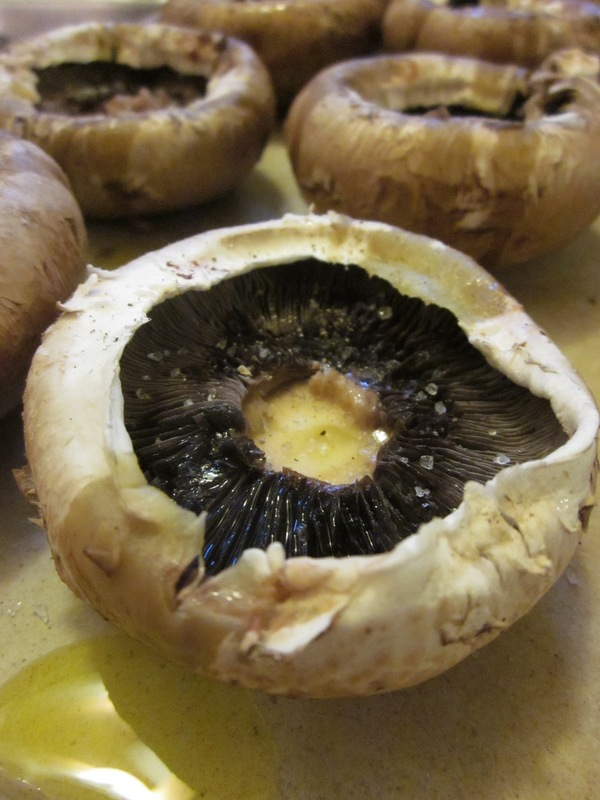 Place the mushrooms on a baking stone, gill side up, and drizzle with olive oil. Season with pink Himalaya salt, freshly ground pepper, and bake about 15 minutes until softened. 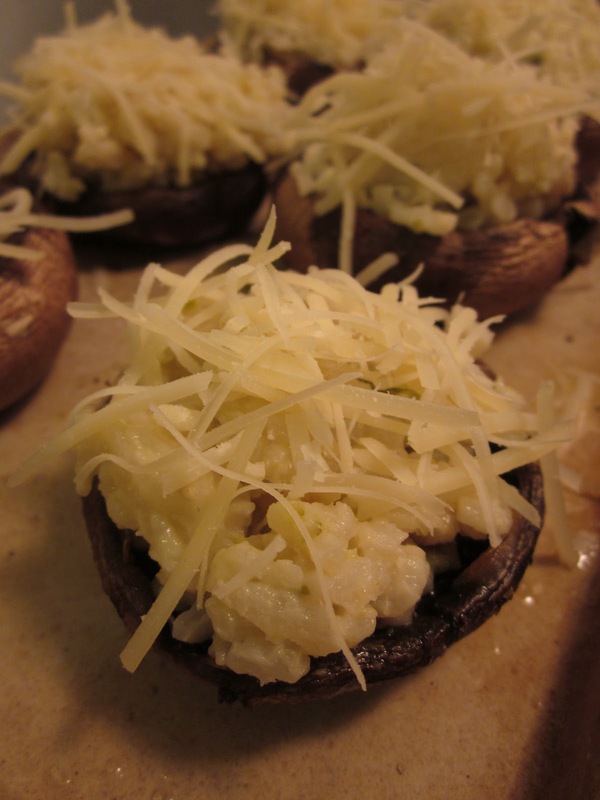 When the mushrooms are softened, spoon the risotto into the caps, press gently, and top with cheese. Bake an additional 10 minutes, until the cheese is melted and golden-hued. Preheat your oven to 350 degrees. Cube your bread, about half an inch to an inch square, depending on how big you like your croutons. Lay the bread on a baking sheet and drizzle generously with olive oil. Season with salt, pepper, and herbs and toss to coat. Spread the cubes out on a single layer. Bake about 20 minutes, or until the bread is perfectly toasted to your liking. Serve atop of crisp green salad. 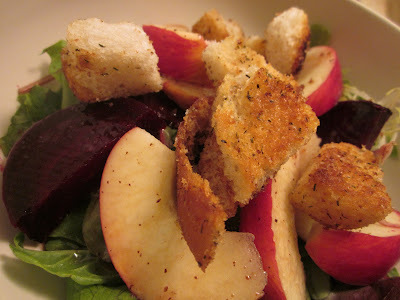 Tonight I made a mixed green salad with roasted beets, fresh apples and these crunchy herb croutons, dressed with a simple balsamic vinaigrette. Delicious and so simple! 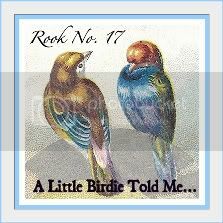 I was just invited by a fellow blogger to participate in a blog hop: Project Pink. October 30th. So, I'll be going pink along with Marilyn of The Artsy Girl Connection for breast cancer awareness. See the other bloggers, below, who are also painting the blogosphere pink for a day. Look for some pink yummies from me...probably with beets! The only cooking magazine I really read cover to cover is La Cucina Italiana. So, when the November 2011 issue hit my mailbox last week, I perused the recipes and was instantly intrigued by the recipe for sartù, a rice timbale from Naples. Timbale means 'drum' in Italian. 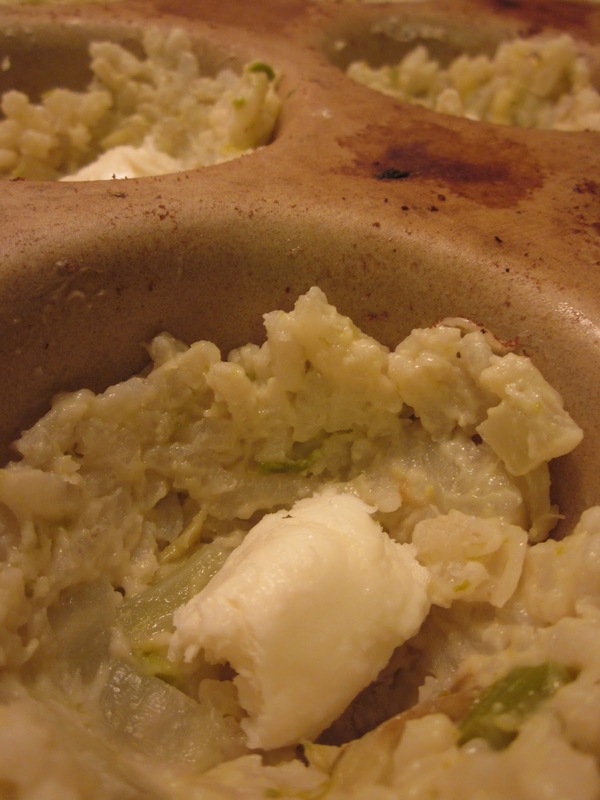 I've made drum-shaped dishes before, but never with leftover risotto. This was a must-try. But just because I read all the recipes doesn't mean that I follow the recipes; as always, I use the magazine more for inspiration. My timbale is more a cross between the Neopolitan sartù and a Roman aranci di riso. 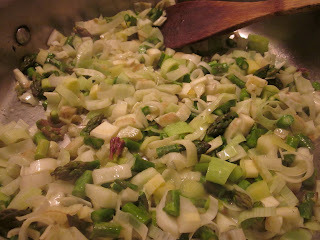 I started with my leftover asparagus-fennel-leek risotto. Yes, this is the recipe for which I made the risotto. I buttered a stoneware muffin dish and pressed a tablespoon of cold risotto into each hollow while I preheated oven to 350 degrees. Then I placed a cube of fresh mozzarella cheese into the middle and topped it with another tablespoon of risotto. Compact the cake gently. Bake for 60 minutes or until the timbali are golden and firm. Cool on a wire rack for 10 minutes. Run a knife around the edge of the pan to loosen and then unmold onto a plate. Top with a dollop of marscarpone cream and a dusting of freshly ground pepper. Serve with a green salad. Tonight I decided to make a risotto - just for the leftovers. My husband accused me of being just like my 9-year-old who wanted to order pizza in a box - just for the box. Thankfully I found out that the box was his actual goal, and not the pizza, so I just asked a pizza place for a clean box and skipped the entire pizza delivery experience. It's not that I didn't want to eat the risotto, I just have a recipe that uses leftover risotto. Stay tuned for that tomorrow. 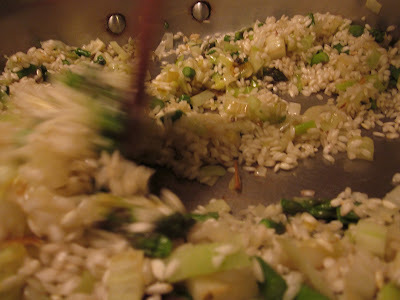 The secret to risotto, as Maria told me, is stirring: usa il cucchiao...sempre. Use your spoon...always; keep stirring. 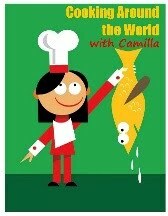 Maria was the cook for the Nuzzo family who was ordered to teach me all her recipes. Then she was fired and I was tasked with cooking for the family six days a week. Thankfully she didn't blame me for the impossible situation and we stayed close throughout the year that I was there. And sometimes when I cook, I head her instructions in my head. Make risotto with whatever you have on hand. Tonight I used sliced fennel, sliced leeks, and chopped asparagus. Stir in the arborio rice - one handful per person you're serving and un'altro per la pentola (an extra for the pot). Maria's voice again. Add one ladel of simmering broth* at a time, stirring, stirring, and stirring some more till the liquid is absorbed. Repeat until the rice is soft. Let stand for 5 minutes. Season with sea salt to taste. 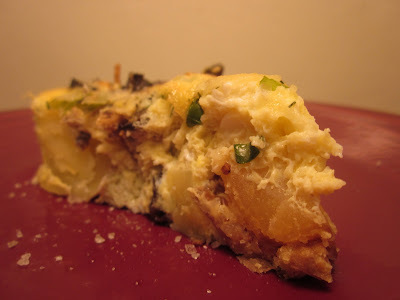 Stir in marscarpone cheese. Serve with shreds or shavings of parmesan cheese. *here's a trick I love: instead of using straight broth, use the cooking liquid from whatever else you're cooking that night. 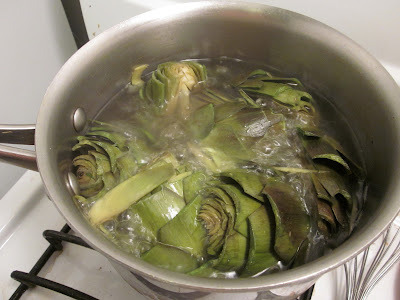 For instance, tonight I was also cooking artichokes. So when they were done cooking, I used the liquid for additional broth in the risotto. Because the artichokes were submerged in the water, some of the vitamins were leached out in the cooking process, but you're now getting those back by using them in your other dishes. 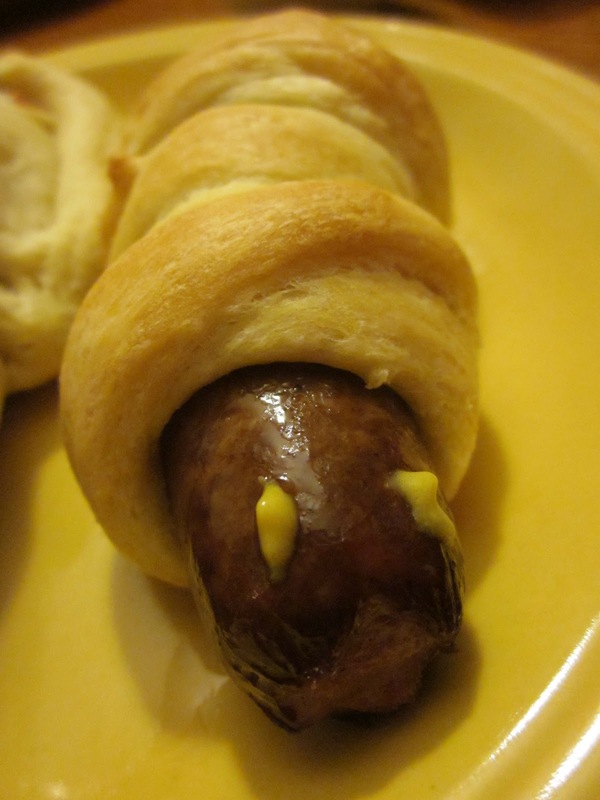 Here's another great picnic dish that takes just minutes to prepare. Bulghur wheat is usually sold parboiled and dried, so it does not need to be cooked before eating, though it does take a little bit of planning since you have to soak it overnight. Place bulghur wheat in a large bowl, add 1 T dried thyme or any other herb you have on hand. Fill the bowl with cool water so that the wheat is submerged by at least 2" of water. Cover and refrigerate overnight. 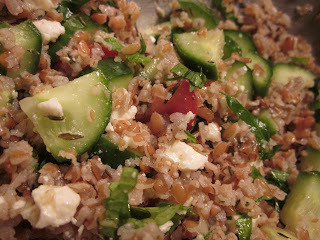 In the morning, drain the bulghur wheat, add crumbled feta cheese, diced Persian cucumbers and diced tomatoes. Add 1/4 C fresh, rough chopped parsley and 1/4 C fresh, rough chopped mint. Season with sea salt, freshly ground pepper, and juice from half a lemon. Toss with olive oil and serve cold. 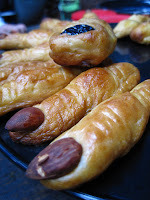 or 'PFP's as a few people who had had too much wine called them today...are an easy, portable appetizer, making them a great addition to a picnic. Pesto is just a mix of fresh basil, garlic, pine nuts, parmesan cheese, and olive oil. In a blender, I start with a bunch or two of fresh basil, washed and trimmed, 4 cloves of garlic, 1/2 C of grated parmesan cheese, 1/2 C of pine nuts. I pulse the blender a few times, drizzle in olive oil, and resume pulsing. Pulse. Oil. Pulse. Oil. Rinse and pat the potatoes dry. Place them in a roasting pan, drizzle them with olive oil, and cook in a 350 degree oven for about an hour. Once they are fork tender, slice them in half, scoop out some of the meat, and fill the hollow with a dollop of pesto. Serve chilled. 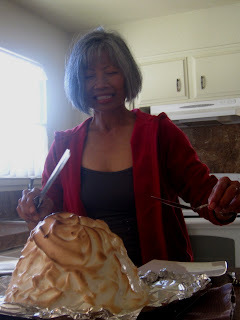 So, I dropped off all the parts of the Baked Alaska and had Nonna put it all together after school. Instead of a choose-your-own-adventure (do you remember those books? ), this was a make-your-own-birthday-cake. It was delicious! Great job and happy 61st birthday, Nonna. 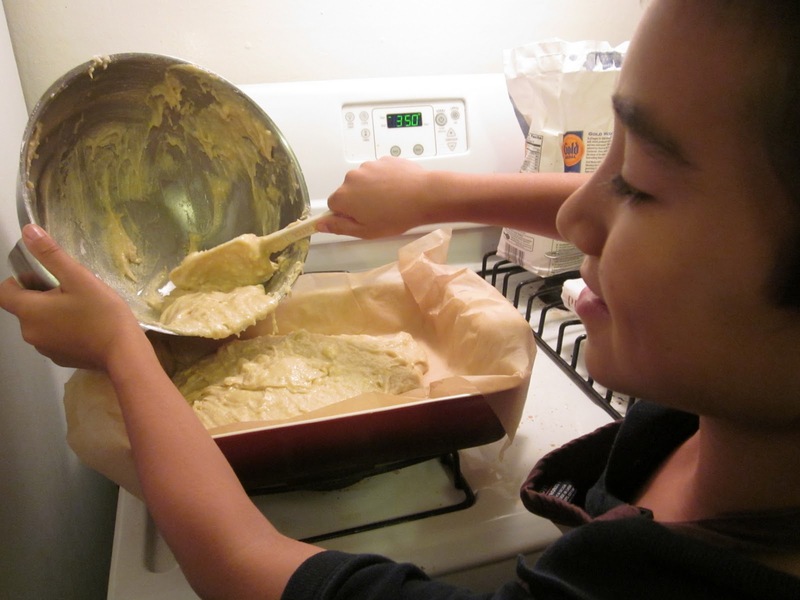 Line a baking sheet with parchment or heavy brown paper. Place cake in center. 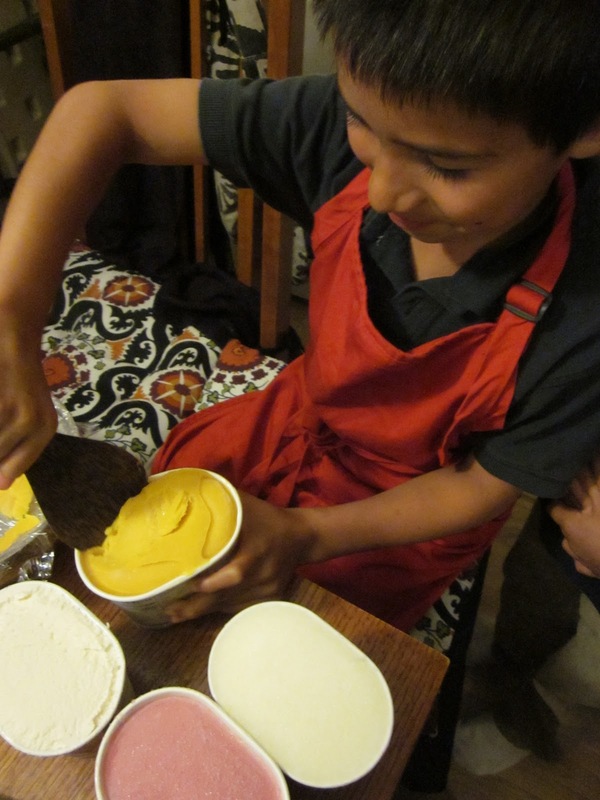 Turn molded ice cream out onto cake. 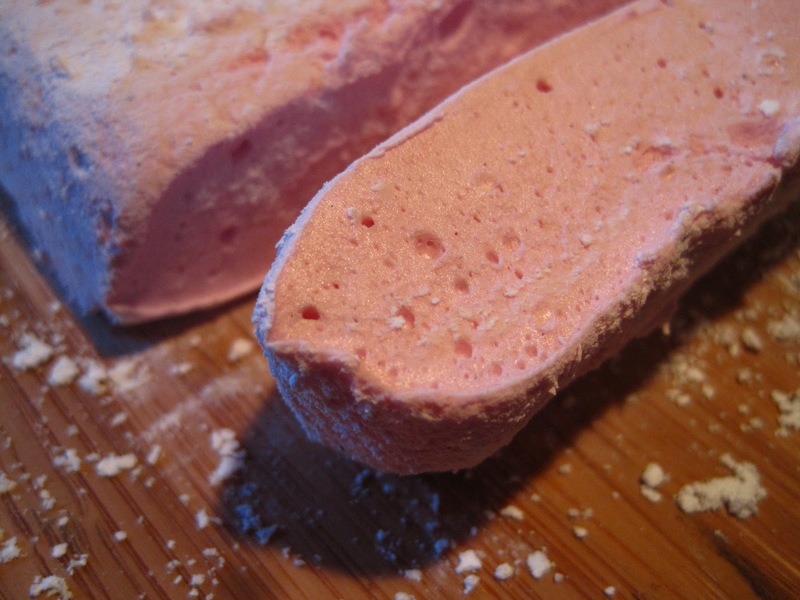 Quickly and prettily spread meringue over cake and ice cream, all the way to paper to seal. Return to freezer. Preheat oven to 425 degrees F. Bake the Alaska on the lowest shelf, 8 to 10 minutes, or until meringue is lightly browned. Serve immediately. How many times a day do you hear, "Mom, it's not fair!"?!? Those four words are like fingernails on a chalkboard to me. And it was levied against me this evening when Dylan started to work on the ice cream dome for Nonna's birthday Baked Alaska. Fine, Riley, make the cake part! I decided to use the Sour Cream Pound Cake from Nick Malgieri's Perfect Cakes cookbook...and add lychee liqueur in lieu of some of the other extracts. Other than that, and cutting the sugar a tad, I followed the recipe fairly closely. Or rather Riley followed it fairly closely. I laughed aloud at Riley's glee in cracking eggs. He thought that was hilarious. Gratefully, he had six to crack. Preheat the oven to 350 degrees. In a large bowl mix the dry ingredients. Stir in wet ingredients and blend till just moistened. Scrape batter in to a parchment-lined baking dish. And bake for 75-90 minutes until the cake is well-risen, cracked on top, and a golden color. Cool completely, then wrap in plastic wrap and freeze overnight. I made the mistake of asking: what kind of cake should we make for Nonna's birthday? I should have stuck with my cardinal rule of giving the boys two choices, both of which did not require me to go to the store. Ugh. 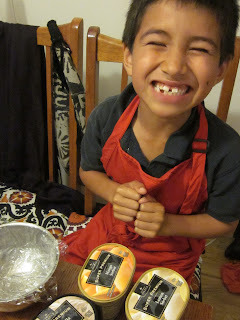 In answer to the question, Dylan, excitedly, exclaims, "let's make an ice cream cake!" I tried to disuade him once, twice, and thrice. But he was adamant, so we decided on a Baked Alaska, and I headed to the store. A Baked Alaska is a dessert made with a sponge cake base, a dome of ice cream, and a layer of meringue that is baked just long enough to set the meringue without melting the ice cream. I liked a recipe that called for multiple colors of ice cream, creating a mosaic in the ice cream dome; Dylan liked that he could pick multiple flavors. 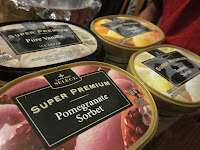 He chose pomegranate sorbet, mango sorbet, lemon sorbet, and vanilla, saying "Nonna really likes sorbets." Okay. Into a plastic wrap-lined bowl, Dylan scooped the different flavors. Pink. Orange. White. Cream. Pink. Orange. White. Cream. I'm pretty sure he had a pattern; he's not big on assymetry. I packed it flat, wrapped the whole bowl in plastic wrap and placed it in the freezer to freeze completely. 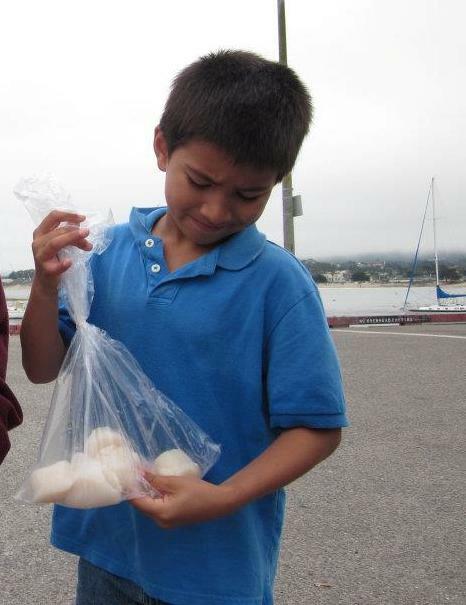 While Riley opted for sardines at the fish market, Dylan wanted scallops which are also listed as one of the "best choices" in the Monterey Bay Aquarium's Seafood Watch cards. Click here to see the Seafood Pocket Guide for the West Coast. I remember reading something about scallops once: cook quickly, sauce lightly. Makes sense since scallops are so succulent and delicate. So, I followed that advice though I have no idea where I read that. In a large, heavy-bottomed skillet I melted some butter with a splash of olive oil. I browned some minced garlic and pressed the scallops into the pan to sear them quickly on each side, probably two minutes per side. Leaving them on there longer would produce a thicker crust and nice color. Next time. 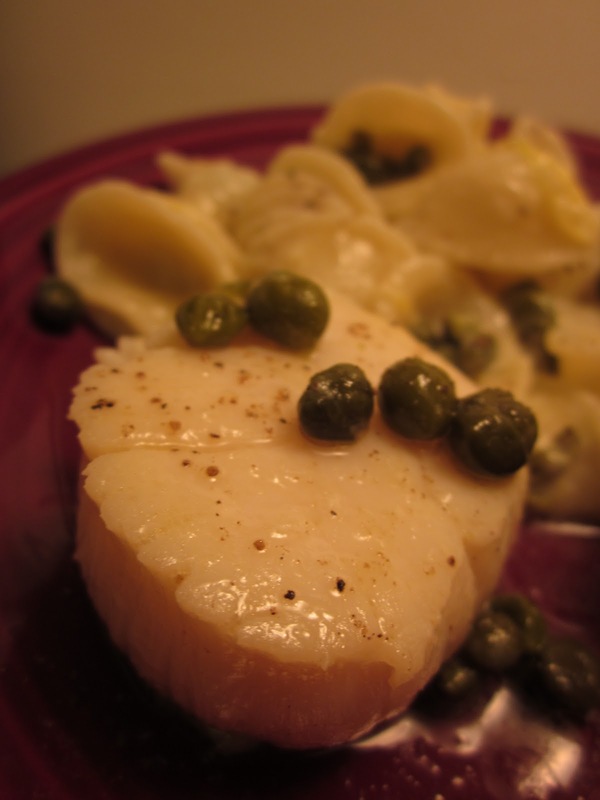 Then I squeezed a little lemon juice over them, added some capers, and salted them lightly. Add a little bit of freshly ground pepper and a dash of paprika for color.